SPARGO, Inc. is pleased to announce that nine of our exposition sales and management clients have been honored with the Trade Show Executives (TSE) “Fastest 50” tradeshows designation for their 2016 shows. In addition, TSE has named the 2016 FAST TRACKERS - THE "NEXT 50" which TSE lists as the shows that were not fast enough to crack the Top 50, but are strong contenders for next year. Three of SPARGO’s clients received this achievement in 2015 and, this year, eleven have done so! 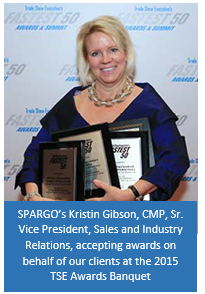 “I am proud, once again, to congratulate our clients and the staff at SPARGO behind their success for being recognized for this achievement. We build relationships, perform market research, utilize technology, analyze business intelligence, attend competitive events, and continuously work the prospect pipeline; however, we can only sell what people want to buy. It is truly a team effort and the quality programs produced by our clients result in “must attend” events. These events deliver the ROI exhibitors want – it’s that simple.” Susan Bracken, President & CEO, SPARGO, Inc.